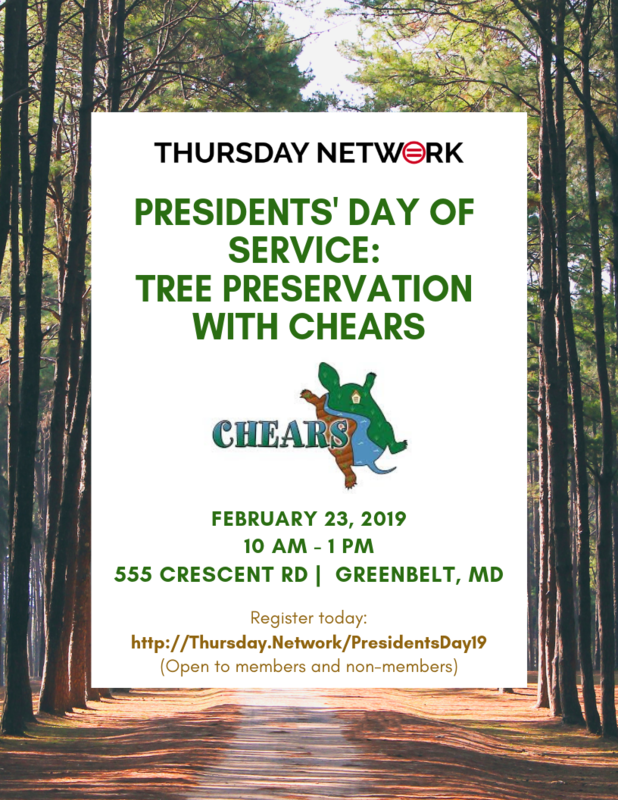 The Chesapeake Education Arts and Research Society (CHEARS) needs volunteers for their Presidents' Day of Service event on February 23, 2019. Thursday Network Is invited to be a part of the community effort to protect trees from beaver herbivory at Buddy Attick Park. Volunteers will work with Public Works staff to place wire caging around the trunks of native trees to protect them from beaver herbivory. Volunteers will meet at the Public Works building located at 555 Crescent Road Greenbelt, MD 20770. The building entrance is located at the bottom of the Buddy Attick Park parking lot and through the gate. Wear weather appropriate clothes and closed-toed shoes.